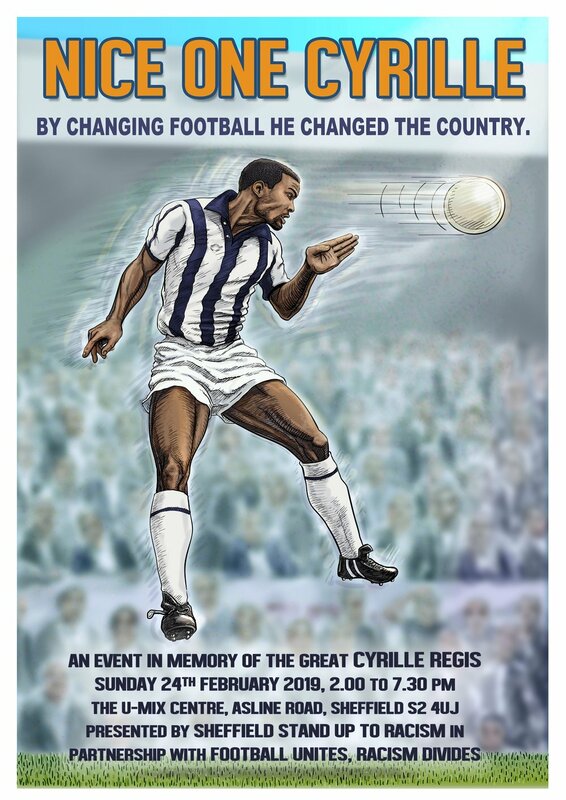 A celebration of the life and times of the inspirational black footballer Cyrille Regis, who fought racism and helped change football. Football Unites, Racism Divides and Stand Up To Racism are jointly organising a tribute to former West Brom and Coventry striker Cyrille Regis with an anti-racist event on Sunday 24th February 2019 - the day after the WBA meet SUFC at The Hawthorns - and just over a year since his untimely death in January 2018. The event, at the U-Mix Centre off Bramall Lane, will begin with three football tournaments - for young people, women and a seniors competition - followed by speeches and personal recollections about Cyrille's life. The day will kick off with the football tournaments at 2pm, with refreshments served at 5pm, followed by the indoor programme, and finishing at 7pm. * Reunion of former playing colleagues. - Chris Green, co-author of Cyrille's biography 'My Story'.